The current entry in the ‘Behind the Scenes’-cycle was written by Robyn Keene-Young, producer and writer of the award-winning natural history documentary ‘Dust and Stripes‘. Following a family of plains zebras through the arid saltpans of Botswana’s Makgadikgadi, the team had more than a few encounters off-camera worth sharing – including some Christmas-spirit. 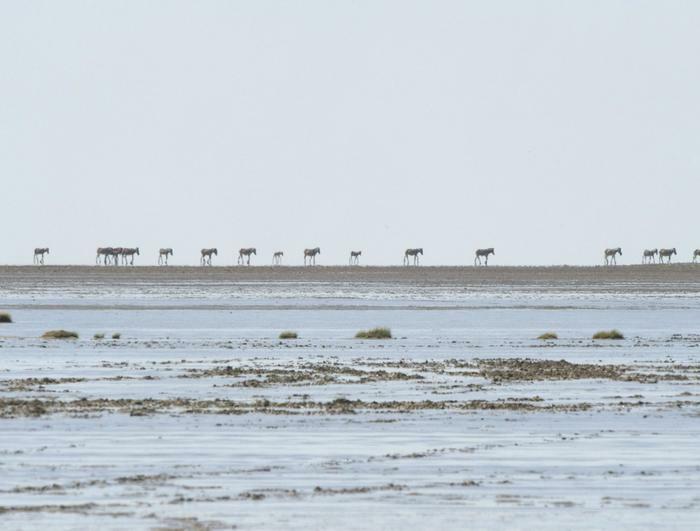 On Christmas morning 2011, we got up, as we usually did, at 04h00, made tea, packed breakfast and set off to a grass island deep in the Makgadikgadi salt pans, where we’d been filming thousands of zebras grazing. Out on the island we came across a lame foal limping behind his parents. He would stagger for a few steps, fall down awkwardly then with some difficulty, graze the grass around where he lay. After a while he would struggle to his feet once more and stumble a few metres forward. His parents stayed close by constantly. 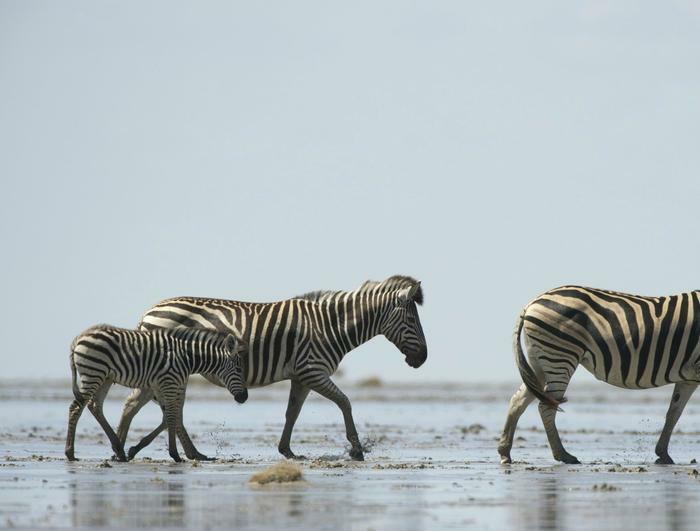 Even when the other zebras moved off the island, his parents continued to graze nearby, regularly returning to his side while they ate. There is no shade out on these islands and the midday temperature was soaring way above 40 degrees Celsius. It had not rained for days, so the pans were dry and there was no surface water nearby. Who knows when last the family had managed to drink; the parents would eventually have to leave his side to go in search of water. By early afternoon, we decided to head back to camp to open presents (yes, Santa even visits tents in the Makgadikgadi!) and rustle up a sandwich for Christmas lunch. We returned to the island a few hours later and found the lame foal all alone. There was not another zebra anywhere in sight. A storm was coming and the poor little zebra looked so scared and helpless against the big, dark skies. As the rain began to fall we were forced to leave the foal and head back to camp – with lumps in our throats. We could not risk being out on the pans in the rain, as the water quickly turns the pans into sticky, sucking mud that can swallow a vehicle up to its axles. We went to bed with heavy hearts that Christmas night. We did not believe for one moment that the foal would survive the storm, and the long night ahead. There were lions nearby, as well as a den of black-backed jackals on the same island, he would surely fall prey to one of these hunters. We were reluctant to return to the island the next morning, but it was important that we record the end of the foal’s tragic story. Several zebras had reappeared on the island and we drove around looking for vultures, or any clues that would lead us to the foal’s carcass. It’s difficult to describe the wonderful surprise when we finally spotted the foal, not only alive, but also in the care of his dedicated parents! We visited the island regularly over the coming days and saw the foal each time, often suckling from his mother while his father grazed alongside. Perhaps it was wishful thinking, but his condition did seem to improve over that time. Unfortunately, a large storm flooded the pan shortly thereafter and we were unable to reach the island for weeks and never saw the family again. But we like to think that they are still together somewhere. Surely the little foal’s brave spirit and his parents’ loyalty is a recipe for a happy ending? To read more about the production ‘Dust and Stripes’, to watch the trailer as well as the production in its entirety, please follow this link.